Saudi Arabia has ended a 35-year ban on movie theaters with a screening of "Black Panther." 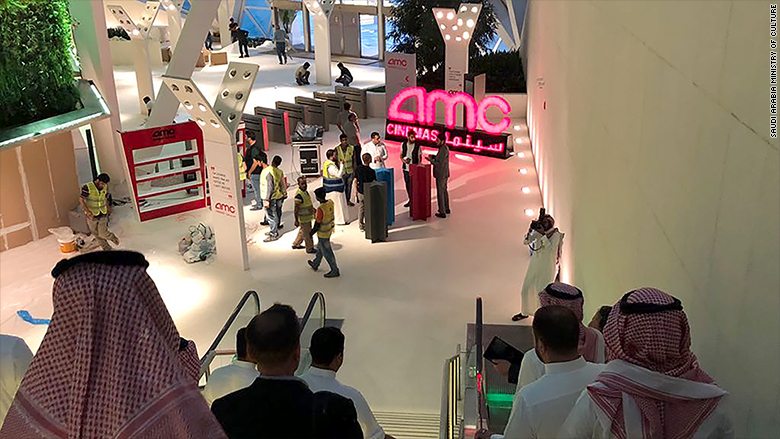 America's biggest movie theater company, AMC, (AMC) played the Hollywood blockbuster on Wednesday at its new single-screen cinema in the financial district of the capital Riyadh. The gala opening was limited to about 500 invited guests, executives and officials, but public screenings of the movie will begin soon, AMC said. A Saudi official said that would happen from May 1. AMC said men and women would be able to sit together at the gala screening. The Saudi official said there would also be no segregation when theaters open to the public -- moviegoers would be able to choose between mixed, male-only and female-only screenings. Saudi men and women are customarily separated in public places. But that restriction is being relaxed. Men and women were able to sit together at several music concerts and events in 2017. 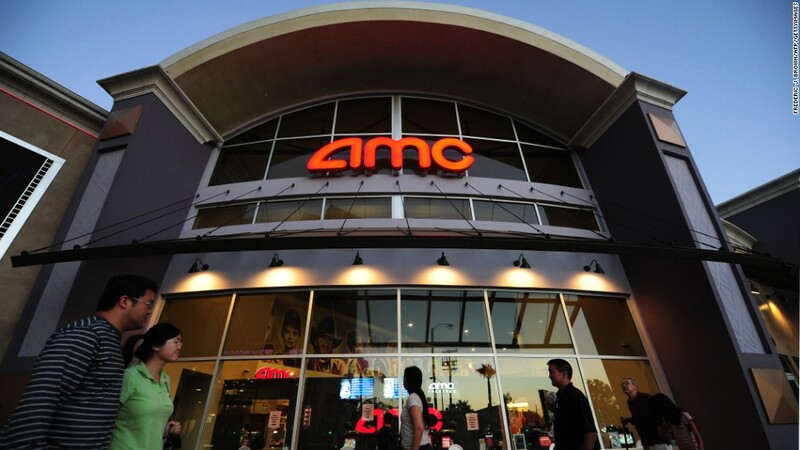 A further three screens are expected to open at the AMC cinema in the coming months and will show a range of Hollywood films. Late last year, Saudi Arabia announced it would allow cinemas to open in the country as part of its economic overhaul, dubbed Vision 2030. The government hopes that opening movie theaters will act as a catalyst for economic growth and diversification, creating new employment opportunities and providing Saudis with a greater range of entertainment options. The goal over the coming years is to reduce Saudi's economic reliance on oil. AMC was the first company to score an operating license from the Saudi Ministry of Culture. "We're going to show typical Hollywood blockbusters that are very popular in the United States and Europe and elsewhere in the world," AMC CEO Adam Aron told CNN. "Hollywood has been showing movies in the Middle East for a long time [and] has proven that it can be sensitive to the local cultures here and in the region." Online movie ticket sales for members of the public are expected to be available in the coming days. John Sfakianakis, director of economic research at the Gulf Research Center in Riyadh, said that opening new entertainment venues will encourage Saudis to spend more money at home rather than on vacations in nearby countries. "The economy will benefit greatly as fewer nationals will exit to watch movies and be entertained," he said. "Younger people and older people will be flooding to the place to see the show," he added. Saudi Arabia's Ministry of Culture forecasts that the country of 32 million people will have 350 cinemas by 2030. AMC, which is owned by Chinese property and entertainment conglomerate Dalian Wanda Group, has plans to open at least 30 cinemas across the kingdom in the next five years. It's hoping to operate half of all Saudi theaters in the long run in partnership with the Saudi state-owned Development and Investment Entertainment Company. Vue International also plans to open 30 multiplexes in Saudi Arabia in the coming years. It said it expects the first venue to open later this year. Vox Cinemas and Novo Cinemas, both based in the United Arab Emirates, are interested in expanding across the border into the new, potentially much bigger, Saudi market. The UAE chains already cater to regional audiences by subtitling movies in Arabic and removing scenes of a sexual nature. AMC's new cinema in Saudi Arabia was undergoing preparatory work ahead of the Wednesday gala. Saudi Arabia said last year that movies "will be subject to censorship according to media policy standards of the Kingdom," to ensure they comply with Saudi values and principles and do not contradict Sharia, or Islamic, law. Saudi Arabia's cinema industry is expected to grow to around $1 billion over the coming years, AMC said. Saudi movie fans already got a taste of Tinseltown in January, when a film festival in Jeddah screened "The Emoji Movie" and "Captain Underpants." -- CNN's Sarah El Sirgany and Chris Liakos contributed to this report.